Football fans around the world are tuning in to Super Bowl 52 tonight, as the AFC Champion New England Patriots take on the NFC Champion Philadelphia Eagles. Millions more will be tuning in for a different reason, though to check out all of the commercials, including new trailers for highly-anticipated movies. In case you're not a football fan, we have compiled all of the movie trailers right here in one convenient place. Unfortunately for fans of the Merc With the Mouth, it was confirmed earlier today that there is no new trailer for the highly-anticipated Deadpool 2. There were reports last week that studios such as Warner Bros., Sony and 20th Century Fox will be sitting out the big game, which isn't surprising for Warner Bros. since they have traditionally sat out the big game. There will still be plenty of movie trailers debuting during the big game, with Universal Pictures dropping new footage from Jurassic World: Fallen Kingdom and the new Dwayne Johnson action-thriller Skyscraper. Brief ads that debuted during the Super Bowl pre-game show confirmed that the Skyscraper trailer will actually debut during tonight's episode of The Tonight Show Starring Jimmy Fallon, which will air live from Minneapolis later tonight following the post-game show and a special episode of the hit drama series This Is Us. One of the most highly-anticipated ads isn't actually a full trailer, but instead a 45-second teaser for Solo, with the full trailer debuting during Monday morning's episode of ABC's Good Morning America. 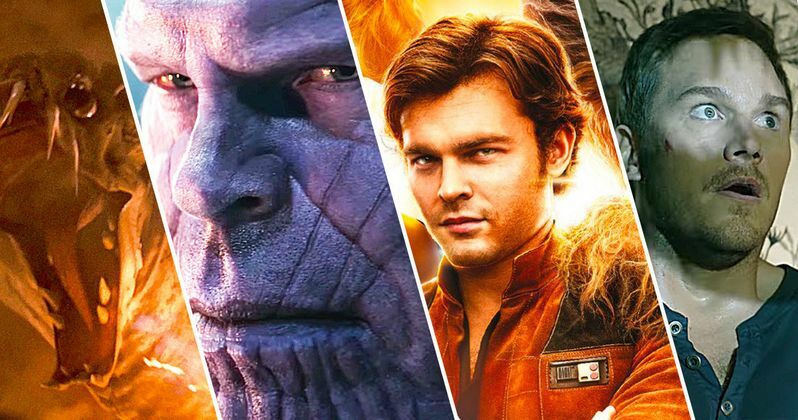 This trailer release strategy is not surprising, since Disney often uses shows that they own to promote Star Wars and Marvel movies, with the studio using shows like the late night talk show Jimmy Kimmel Live and Monday Night Football to debut the trailers for their biggest movies. Other big game commercials include Paramount's Mission: Impossible - Fallout and a former Paramount project Cloverfield 3, which was formerly known as God Particle, which has believed to be picked up by Netflix with this new TV spot expected to possibly confirm a new release date. Marvel's Black Panther will also have a unique presence, with the extended TV spot already debuting early and Chadwick Boseman's T'challa also appearing in ads for Lexus, the auto maker which is prominently featured in the movie. Movie studios dropped big bucks to promote these movies this year, with the price for a 30-second spot expected to be over the record $5 million that advertisers paid during last year's big game. Be sure to keep refreshing this story as we'll be including more ads as they're released. Take a look at all of the Super Bowl movie commercials below, courtesy of various YouTube channels. Oscar-winning actress Jennifer Lawrence reunites with director Francis Lawrence, who directed the actress in the last three Hunger Games movies, for the thriller Red Sparrow. Some fans have been criticizing the film for being too similar to the Black Widow character played by Scarlett Johansson, but the movie is based on a hit book written by a former CIA operative, with the story following a young woman who gets recruited to be a seductive assassin known as a "sparrow." It's possible that this thriller could be one of the first box office hits of the spring movie season. This thriller marks the latest directorial effort from John Kraskinski, who also stars alongside his real-life wife, Emily Blunt. The minimalist thriller follows a young family who lives in the woods but must remain silent, or else a terrifying threat from the outside will attack them. Paramount has set an April 6 release date for the thriller. Universal Pictures unveiled a new look at what could be one of the biggest movies of the year, Jurassic World: Fallen Kingdom, a followed up to the 2015 blockbuster Jurassic World. The original movie broke The Avengers opening weekend box office record when it debuted in the summer of 2015, although that record would be broken later that year by Star Wars: The Force Awakens. Director J.A. Bayona takes over the helm from Colin Trevorrow, which could be one of the biggest blockbusters of the summer movie season. This footage is among the most anticipated of all the Super Bowl trailers, although this 45-second spot is only a preview for the full trailer, which is slated to debut during ABC's Good Morning America on Monday. Many expected the trailer to reveal a new release date, but it's clear that Disney and LucasFilm are sticking with the May 25 release date. Be sure to check back tomorrow morning for the full trailer. This big game spot is also just a preview for the full trailer, with star Dwayne Johnson appearing on The Tonight Show Starring Jimmy Fallon tonight, live from Minneapolis, to unveil the full trailer. This teaser showcases perhaps one of the biggest shots in the movie, showcasing The Rock making a death-defying leap from the top of a crane, into the burning Skyscraper, to save his family inside.